The invasion has begun. Join the fight. Save the world. 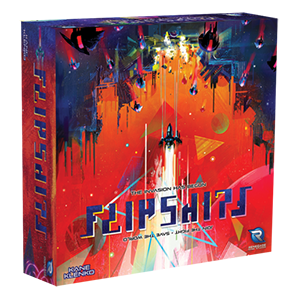 If you enjoy a dexterity game now and again, the co-op Space Invaders-like fun of Flip Ships is for you. It’s easy to play (but spiced up with a few special abilities), colourful and fun. The relentless advance of the enemy ships (well, cards) adds a nice level of tension and a ticking clock to the otherwise simple task of flipping little cardboard discs. Did I say simple? Not really, though you’ll be surprised how quickly you’ll fine tune your flipping skills. And I guarantee you won’t be able to resist making that chugger chugger chugger sound that the Space Invaders ships used to make as they marched down the screen towards detroying you.